Marriage The Time of Your Life! Home / Portfolio / Marriage The Time of Your Life! Can Marriage Really Be The Time Of Your Life? Good News...The Answer Is YES! 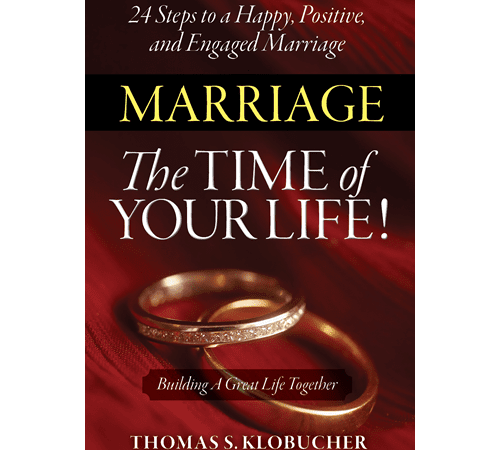 Marriage: The Time of Your Life is a practical book on how to transform your marriage through the 24 steps of engagement that can change your life! As I think about the ways that people have talked to me about their spouses and marriages, it seems to me that people are looking for excitement and fulfillment. I will gladly go on record right here by saying that my marriage to Carol is one of the most exciting and fulfilling things I’ve ever experienced! But I’m concerned that many of us may be too eagerly pursuing these feelings as if they were the goal of marriage. They’re not. Like a professional whose career doesn’t amount to as much as it could have because of a consuming focus on money rather than making significant contributions, I fear that many of us may be unintentionally short-changing ourselves and our spouses by viewing the rewards of a good marriage as if they were the goal. So, I wrote this book to share something with you that it took me quite a long time to learn: Marriage is the greatest opportunity that God has given us to devote ourselves to sacrificially building up another person so that he or she thrives. I find this responsibility to be exhilarating, but it isn’t easy, and it doesn’t always feel “right.” It demands far more of someone than the lazy, short-lived connections that fictional, commitment-wary individuals find with one another in romantic films. But it also yields something of immense and lasting value! A lifelong commitment to the thriving of one’s spouse is the foundation of something truly thrilling—a Transformational Marriage! I can say with complete confidence, from over 50 years of personal experience, that such a marriage is the time of your life!